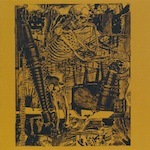 Here we have a collection of non-album, unreleased tracks from the power electronics long stayer Grunt; well respected within the genre this is a notch above some of releases out there from other artists and the pedigree does show somewhat. What is to be expected are the usual vocal samples and masses of visceral feedback and blistering noise, assisted with biting, seething vocals that rip through the distortion pedals with a fair amount of ferocity. A good level of variation is key with PE; it’s way too easy to get lost in the outright onslaught and lose focus; Grunt has mastered this to a fine art and version four of the title track is one of the better pieces of work on this CD; with the noise sitting low in the mix as a residual hum, this in turn allows vocals prominence and the effect is the perfect blend of what I expect when looking for the perfect interpretation of this genre. Grunt for me is by no means the best this scene has to offer though, the project does lack the cohesiveness of say, Deathpile or Control for example; a lot of his works can bit hit and miss and this compilation is a fair representation of that notion. There is however more on this release to keep the avid Power electronics fan happy, Grunt has a history when it comes to writing such works and this is plainly evident; altogether I did find a heck of a lot on this album highly enjoyable. Two reissues here, plus a compilation of rarities and odds and sods on the Finish Industrial Recollections label; which is a home for all things experimental and some might argue, proper Industrial. 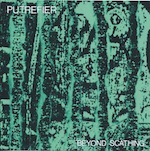 Putrefier is a project that will only satiate the purist consumer of noise and power electronics; there is a massive underground market that will lap up the works of Mark Durgan and these three albums will have been pretty rare to come by in their original formats on the Broken Flag label in the mid to late eighties. A variety of instrumentation are utilised on these releases, from analogue synthesisers to various delay systems and amplifiers; the result is a barrage of visceral scrapings of sound as a collective mass that tear at the listener from the moment you hit play. There is barely anything to separate ‘Beyond Scathing’ and ‘Cog Dominance’ as releases; if anything they could be the same album and back to back from ‘86 and ’87 the charm lies in the sound, that whilst showing its age, does have an altogether earthly feel and grass roots home tape ethic, that has more substance in its organic roots than the quality of sound on offer. The ‘Unreleased and Compilation Archive’ album has a lot more to offer for the uninitiated; a more cohesive collection of works that has a lot more to offer than previous affairs. What I do find endearing is the altogether live feel of the release and should appeal to fans of some of the works of Con-Dom and so forth. As reviews go there isn’t that much that can be said when all three of these albums are presented to you at once and are best listened to as a whole in one session, back to back; most likely these would have been better packaged together as one release as there is a lot lost with these being separate items.